V.O.W N°43 // How Much Does Your Building Weigh, Mr. Foster? The Firma Casa was founded in 1994 by Sonia Diniz Bernardini; a company focusing on designer furniture. Throughout its years of operation, Firma Casa has been faithful to their philosophy promoting and supporting young Brazilian designers by introducing new names and companies into the Brazilian market. 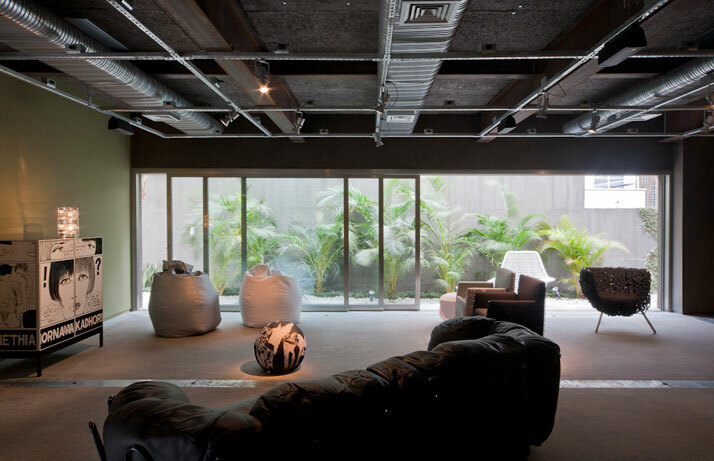 Such is the case for the renovation of the Firma Casa store – where owner Sonia Diniz Bernadini invited SuperLimão Studio, a young architecture and design studio along with world renowned designers Fernando and Humberto Campana onto the project. The renovation project was initially developed in November 2008 where after fourteen years of operation Firma Casa decided that they needed a facelift. The design of the project was completed in 2011 while construction was completed within the year. The project consists of a two storey building, the total surface area of 505.47 square meters is divided into a gallery, a retail store and, the second floor is exclusively occupied by the offices of Firma Casa. 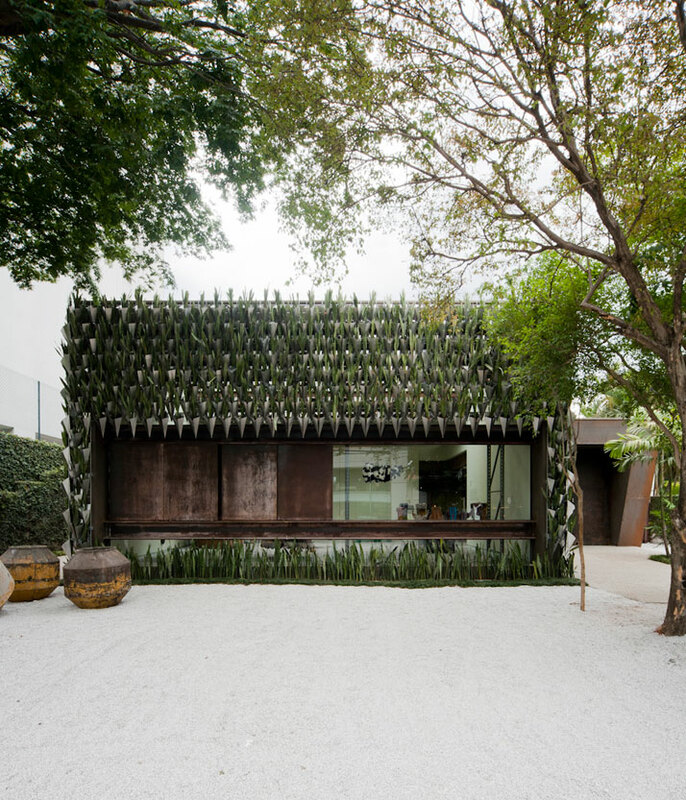 The approximately 500 square meter building is located on a 952 square meter site in Sao Paulo, Brazil. The Firma Casa new structure combines a rather unusual design which was introduced as a design trend in the Milan Salone del Mobile in 2010. 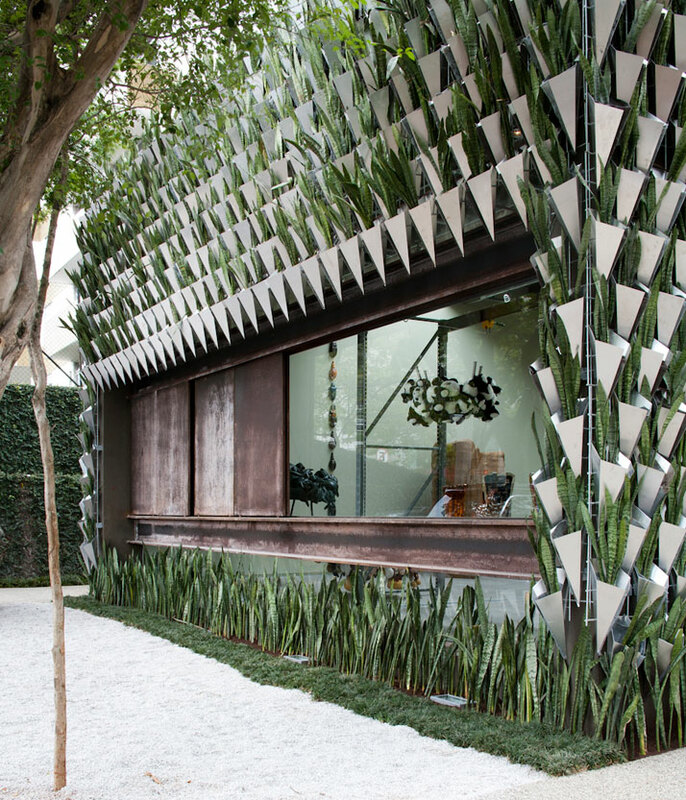 The façade is covered mostly by a green wall made up of 3,500 vases with 9,000 green seedlings. 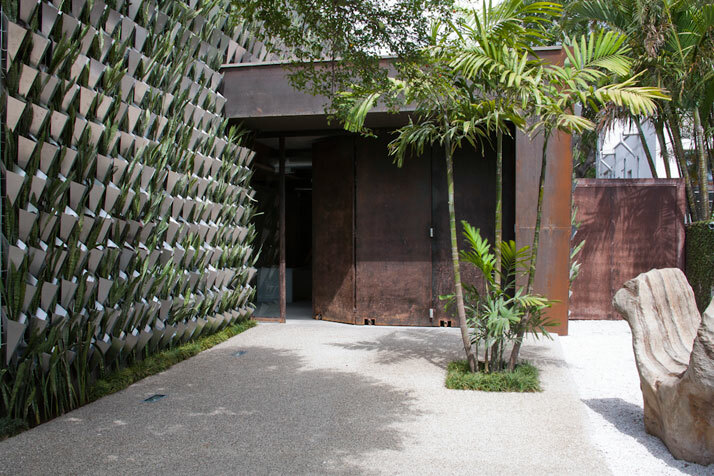 The architecture is simple, contemporary, industrial and elegant; as wrought steel comprises the façade along with the green wall adding for that industrial feel. 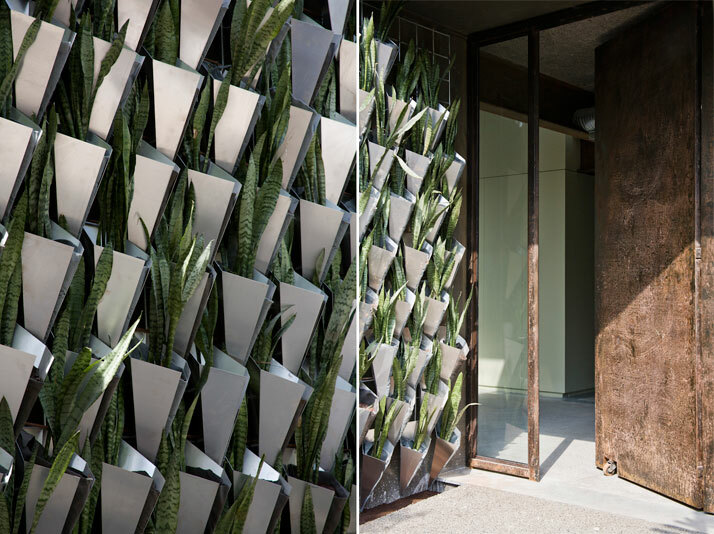 Designers Fernando and Humberto Campana suggested this green wall with Espada-de-São-Jorge (Sansevieria Trifasciata), a plant with African origin, very diffused in Brazilian popular culture because of its protective superstition power. Of course fitting 9,000 green seedlings of Espada-de-São-Jorge on the architectural facade was an architectural challenge. So SuperLimão Studio developed a bent aluminum vase, with an origami form to support the plants. In total, there are 3,500 vases with 9,000 seedlings of Espada-de-São-Jorge covering the façade protecting Firma Casa from the ‘evil eye’ – a superstition belief. The architecture of the Firma Casa building has been greatly influenced by ‘form follows function’ where the steel structure provides flexibility in the design and functioning process. 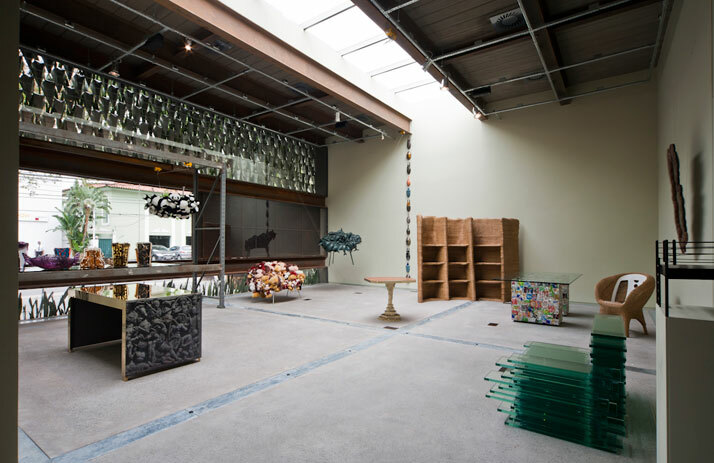 For instance, large steel panel doors on the façade allow for large pieces of furniture or art to be carried into the gallery/retail store space without any difficulties. Additionally, industrialized concrete flooring supports heavy weight objects, such as sculptures, and heavy-duty furniture without leaving any marks on the floor. Additionally, in the outdoor area Elastopave®, was used to give the floor the capacity to drain rainwater. The interior design of the Firma Casa is fashioned in an overall industrial scheme where the concrete floor, the exposed steel structure and air conditioning ducts, as well as the grid of electric rails are exposed. These of course were not only left exposed for aesthetic reasons, but also for practical reasons as the steel beams can be used with industrial magnets to hang pieces, and pallet shelving can support different pieces with different dimensions. SuperLimão Studio looked for flexibility to develop the project with could be used for many different exhibitions. As you can understand this is of outmost importance as the space is flexible and can change at any given time, as it can also provide for a new program at a minimal cost. 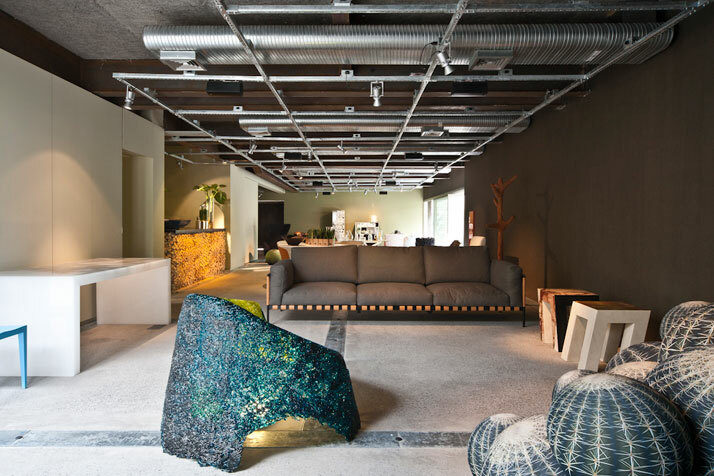 Additionally, this industrial setting effortlessly allows for designer furniture and artwork to project into the space easier than they would be possible in another setting. Furthermore, the lighting on the rails can be changed at any given time according to what the Firma Casa wants to project or not. Large openings allow for abundant natural lighting into the space, while the exterior landscape which has been designed by Fernando and Humberto Campana and executed by Maria Helena Cruz allow for a ‘pure breed’ Brazilian landscape. The designer furniture, the artwork and the sculptures add hints of colour and constantly changing forms to the Firma Casa’s interior design. The artwork and the products constantly provide for a new feel and atmosphere; the concept of the design and the space is overall inviting and pleasing for the visitor, while the best part of all is that it is functional as most of the design has been created with one factor in mind – form follows function.